Does Biden Have a Catholic Problem? When Barack Obama announced that he had chosen Joe Biden as his running mate, Catholic Democrats knew some kind of religious rumble was inevitable. They had spent the 2004 campaign watching John Kerry pummeled by charges that he was not a good Catholic and by warnings that he could be denied communion because of his support for abortion rights. Already this year they had seen pro-choice Catholic Kathleen Sebelius knocked out of vice presidential contention after her archbishop imposed a "pastoral action" on her, demanding she no longer receive the Eucharist. Sure enough, the day after Biden's selection the archbishop of Denver declared that the Catholic senator should "refrain from presenting himself for communion." Archbishop Charles Chaput was one of the handful of Catholic leaders who had targeted Kerry in 2004, but he had become a marginalized in the bishops conference  losing key leadership elections  in part because of his extreme views about denying communion to politicians. His warning to Biden stood alone. Even the conservative Catholic League's Bill Donahue, who rarely hesitates to fire off press releases condemning Catholic Democrats, was unusually silent about Biden. Then the Bishops stepped in. On Wednesday, the U.S. Conference of Catholic Bishops publically called out Biden for comments he made about abortion on NBCs Meet the Press. Even Kerry, whose support for abortion rights is much stronger than Biden's and who was running at the top of the ticket, never generated attention from more than a handful of the most extreme bishops. The involvement of the bishops conference is a clear signal that the communion wars are not over. And it has Catholics Democrats worriedly asking themselves: Can one of their own ever again win national office? In many ways, Biden is in a better position to deal with criticisms of his Catholicism than Kerry ever was. The 2004 Democratic nominee was utterly unprepared for the attacks that came his way. He had to contend with a press corps that trailed him to mass each Sunday and practically accompanied him to the communion rail to see if he would indeed be given the Eucharist. And when Kerry's campaign decided to remain silent about the issue, he left unchallenged the idea that he was a bad or insincere Catholic. Biden, in contrast, knew what was coming. Delaware's Catholic leaders have never sought to withhold communion from the senator because of his support for abortion rights. But in 2006, then-Wilmington Bishop Michael Saltarelli pressured Biden's high school alma mater into dropping plans to name a new student center after him, citing a 2004 statement from the USCCB: "Catholic institutions should not honor those who act in defiance of our fundamental moral principles." 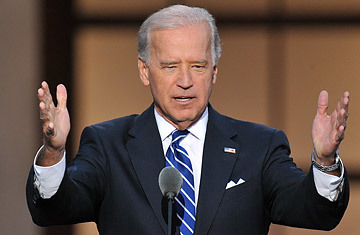 While he accepted Bishop Saltarelli's directive, Biden can be feisty about defending his Catholic faith. At one 2005 political event, he memorably vowed that "the next Republican that tells me I'm not religious, I'm going to shove my rosary down their throat." That spirit, along with his Scranton roots, could attract him more sympathy from fellow Catholics when criticized by church leaders. "His blue-collar background may inoculate him in ways that it couldn't for John Kerry," says Bill Roth, president of the Catholic Democrats PAC. Biden also benefits from the work of progressive groups like Roth's that didn't exist in 2004. Catholics United, for example, has developed a specialty in religious rapid response, blasting out a press release "Palin Attacks Catholic Community Organizing by Senator Obama" shortly after the GOP running mate's speech at the Republican convention. And some conservative Catholics are speaking out as well, venting their disappointment with Bush policies that have not reflected Catholic social teaching and with the Republican Party's focus on overturning Roe v. Wade as the only way to address the abortion issue. Douglas Kmiec, a former Reagan administration official and Obama's most famous conservative Catholic supporter, has rushed out a book about his choice in time for the fall campaign: Can a Catholic Support Him? Asking the Big Question about Barack Obama. But it's the renewed confidence and assertiveness of Catholic Democrats that may have gotten Biden in trouble. During a September 7 appearance on Meet the Press, moderator Tom Brokaw asked Biden to answer the question "When does life begin?" From a Catholic standpoint, the Democratic candidate started off well, telling Brokaw, "As a Roman Catholic, I'm prepared to accept the teachings of my church  I'm prepared as a matter of faith to accept that life begins at the moment of conception." If he'd stopped there, Biden would have been fine. But he went on to argue that there was a debate about the question in the Catholic Church, throwing in a Thomas Aquinas "Summa Theologia" reference for good measure. It was that extra flourish that got the attention of the bishops, according to Father Thomas Reese, senior fellow at the Woodstock Theological Center. "Politicians should not do theology," says Reese. "Whenever they start interpreting Catholic teaching, they invite Catholic bishops to jump all over them." Within days, Cardinal Justin Rigali, who heads the USCCB committee on pro-life activities, and Bishop William Lori, who chairs the committee on doctrine, drafted a statement outlining Biden's theological errors that was released on behalf of the entire bishops conference  a rebuke not even Kerry received in 2004. Biden may have had Nancy Pelosi to thank for the fact that the bishops were already on a hair-trigger alert. Two weeks earlier on the same program, Brokaw had posed the same question to Pelosi, who had refused to answer. "Over the history of the Church," she insisted, "this is an issue of controversy." It is true that lay and church scholars engaged in a vigorous debate in the 1960s over the acceptability of contraceptive use before Pope Paul VI ended the discussion by reiterating official Church opposition to birth control. But the issue was separate from the question of when life begins, over which there has been little internal debate. The official Catechism says that "human life must be respected and protected absolutely from the moment of conception." Pelosi's statement provoked swift response. Washington Archbishop Donald Wuerl issued a statement calling her comments "incorrect," while her own archbishop in San Francisco characterized them as "in serious conflicts with the teachings of the Catholic Church." Pelosi and her archbishop are in the process of setting up a meeting to discuss their differences. But one prominent liberal Catholic privately called the episode "a disaster." Chris Korzen of Catholics United agrees that the Democratic forays into theology have not helped their cause. "There's a legitimate conversation to be had about how best to translate the teachings of the Catholic faith into public policy," he says. "But as far as the Church is concerned, doctrine is off-limits. When public officials make those comments, of course the bishops need to correct that error." As much as these missteps have made them groan, Catholic Democrats like Korzen complain that there is an inconsistency in the bishops' actions. In a recent interview with Religion News Service, Archbishop Chaput was asked why he has not also denounced the conflict between John McCain's support for embryonic stem-cell research and his statement that life begins at conception. Chaput responded by denying that McCain held that position. When reminded by the interviewer that McCain has made public statements of support for embryonic stem-cell research on numerous occasions, Chaput switched gears, arguing that he would only have reason to express criticism if McCain had vocal Catholic support, "if a group came out [called] Catholics for McCain.'" There is in fact a "Catholics for McCain" organization. But contesting the fairness of criticism won't help Democrats this fall. They are already poised to improve on Kerry's support from Catholic voters, whose top issues this year have been the economy and national security instead of hot-button moral issues. In a TIME poll of Catholic voters conducted this summer, a full 80% said that they could vote for a candidate whose position on abortion differed from theirs. Even so, Catholic Democrats can't afford to look like the kids in the corner who don't know their Catechism. In the future, they might want to resist the temptation to wade into theology and stay firmly in the world of policy.